It’s clear ... Motorcycle helmets save lives. To help protect the lives of motorcycle riders, the U.S. Department of Transportation (DOT) requires that all motorcycle helmets sold in the United States meet Federal Motor Vehicle Safety Standard (FMVSS) 218. This standard defines minimum levels of performance that helmets must meet to protect the head and brain in the event of a crash. Each year, DOT conducts compliance testing of a variety of motorcycle helmets to determine whether helmets being sold in the United States meet the Federal safety standard. Because helmets add such a critical margin of safety for motorcycle riders, many States now have laws requiring use of helmets that meet FMVSS 218 requirements. Some motorcycle riders are violating these State laws by wearing unsafe helmets that do not meet FMVSS 218. Most of these helmets are sold as novelty items and circumvent FMVSS 218’s requirements. 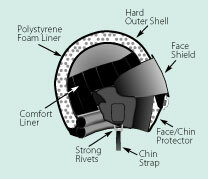 In some cases, some motorcyclists purchase these helmets in the mistaken belief that they offer protection. However, many people who wear these novelty helmets know that they are unsafe – but wear them anyway. This brochure explains how to identify unsafe novelty helmets as well as how to distinguish unsafe helmets from those that meet the Federal safety standard.